In this article I am going to give you the AP ICET Previous Papers. 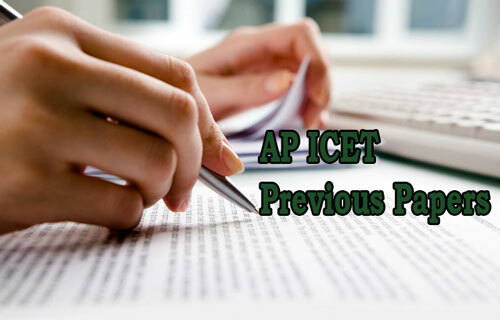 Candidates who have applied for AP ICET exam 2019 are searching for AP ICET previous papers. This exam is going to be held on May 2019. Mostly all experts and toppers are always advised to practice the previous papers, as based on the questions asked in the previous papers you will get an idea of what to be prepared for the examination. So we are providing the AP ICET Previous Papers for you which will be useful for your preparation. Here the download link is also available to you. Practising from the Previous Year Question Papers will help the candidates gain confidence. As the aspirant starts thinking that he knows the question paper in a better way. The best advantage of these AP ICET Previous Papers is that some of the questions from these can repeat in the coming exam paper. Therefore, this is helpful from the score point of view. These question papers help the candidates analyse their level of preparation. They can understand that to which extent they have to prepare. If the aspirant solves these AP ICET Previous Year Question Papers wisely then, he will surely qualify the examination in an effective manner. Here are the AP ICET previous papers , you can directly download these papers and prepare for your AP ICET exam. We have provided the AP ICET previous papers of 2017, 2016, 2015,2013,2012,2011 and 2010. You can view all the papers. Hope this article will be helpful in finding the best AP ICET Previous Papers for your Exam preparation.